I was kitting stuff up to take on a massive road trip this summer, and I decided to make a throw pillow cover for a pillow form my daughter had. When I had visited last I noticed she did not have a cover for it, so I measured the form. One of the quilts I was kitting up was another mountain quilt that she wants. I am doing it in various grays and off whites to light golds. Well as I was cutting the 8.5 inch squares I cut some random sized strips to make pillow cover. So since it was 22.5 inches cut 16 6 inch squares of workbook paper. I had decided to put a black strip down the center and the grays on one side and the neutrals on the other. This ended up making an asymmetrical block. So you know what that means...lots of arrangements. I was really liking how these were looking so I think the mountain quilt will be great! Later in the day I saw a billboard for a quilt shop in Hays, Kansas so I stopped there and found a few fun fabrics to go in the quilt...the baby is being born into an army family so I thought the camo fabric and army men had to go in the quilt. 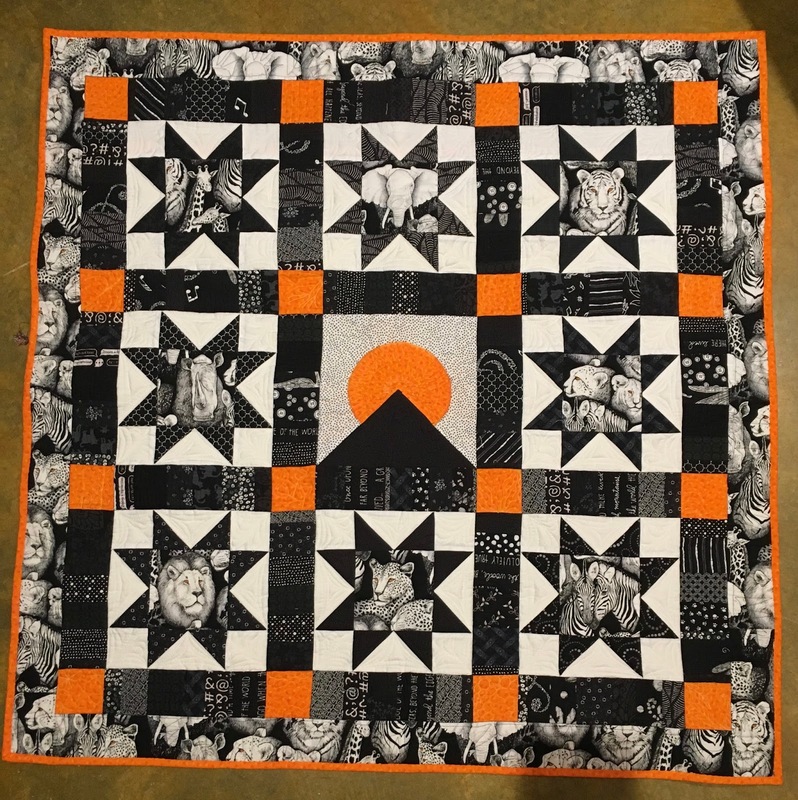 So nice to find a partly done project that can be finished in a bit to be a quilt!! I may get to do some more shopping today, but I left my windbreaker at home and am going to need one...where we are going the high is 68!! Hope all are having a great week...This has been the end of the school year for me so it has been busy. I have just done a few completions of things and am getting ready for a much needed vacation with my daughter to the western part of the US. 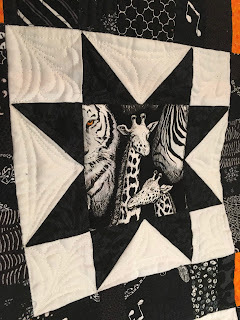 When I got my quilt, Shadows of Kilimanjaro back from the Mountain Quiltfest Show I also received the judges comments. She marked it down as some parts were quilted heavier than others. So I decided to quilt the white blocks....I wish I had come up with a better pattern but it is what it is...I have given it to my daughter to hang in her apartment since she has hiked Kilimanjaro. 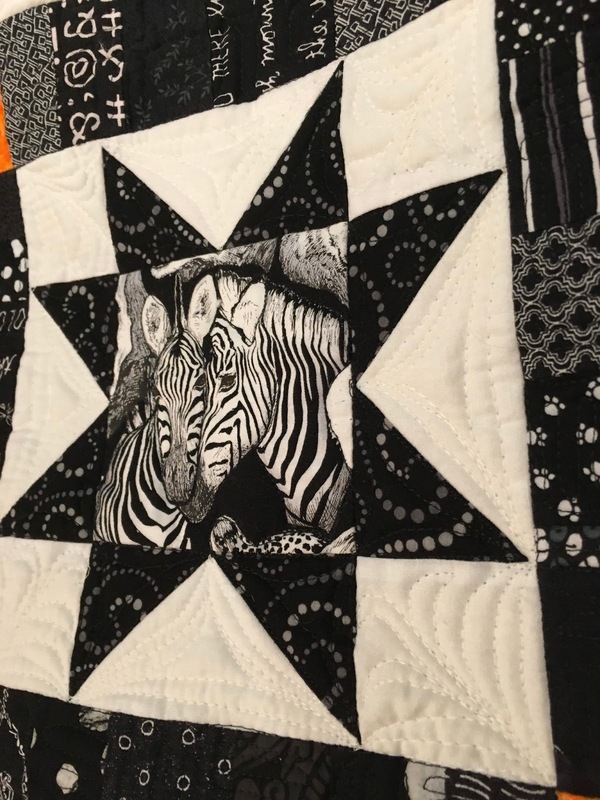 I didn't think the quilting showed up in the photo of the whole quilt so I included a couple of close up of the blocks. I also finished making the flanged binding for the Jelly Roll quilt. 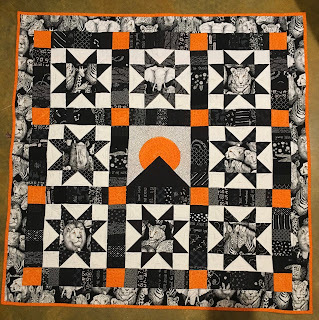 The final project that I worked on is the Possum Town Quilters guild challenge. We are doing a Mississippi bicentennial quilt since it is our state's 200th birthday. I chose to do Mississippi Blues. There was a list of suggested topics for squares. The challenge is to create a 9 in finished block using 3 of the 5 fabrics given. I thought the blues would be a good one to do. So my idea was to make a background of blue squares, and I kind of wanted a Howlin' Wolf on it as he was from the Golden Triangle. So first I made the background, using some of the blue in the packet, then sent it to Lauren, a friend from the guild and asked for suggestions. She sent me a few wolves and the logo from the Blues Trail. That made me think of a state silhouette. So I printed the elements and put them on the background. I liked it but they were a little too big. So I took it to work and shrunk the elements down a little and then the scale was better. So I was going to hand sew them down, but then I got intimidated by the narrow pieces and the corners of such small elements, so I decided to fuse them down. I zig-zagged around each element to be sure it would be secure. I had a thought while I was giving exams, to write the names of some of the famous blues artists on the outline of the state like it was a trail. So when I got home a printed a list of blues artists from Mississippi and picked out some to put in the border. I am happy with the final result. 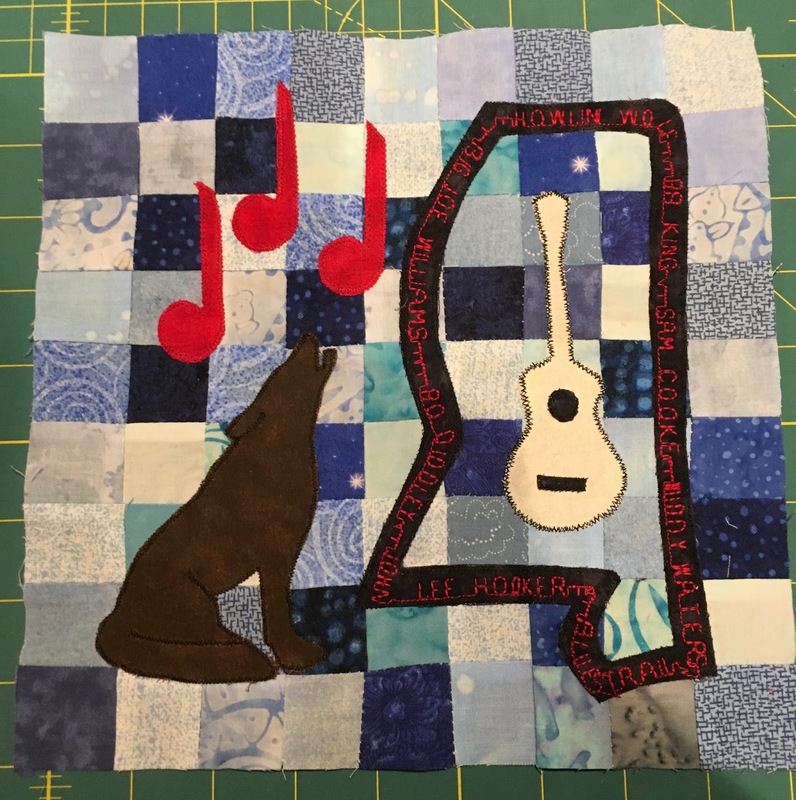 The other two challenge fabrics used is the brown for the wolf and the cream for the guitar. I did mess up and put the fuse stuff on the wrong side of the cream color, but decided I liked it like that as it softens the print on that piece. Celeste and Blake came for my dad's 88th birthday. It was nice to see both of them. When I was taking Celeste back to Memphis, we stopped at a whole in the wall restaurant for an Ethiopian meal. It was really good. I wish I could tell you it's name, but it was really good. 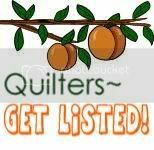 May not post much about quilting as I am going to be off the internet for a bit...but if I get a chance to post I will get back on! !